Having spoken to Gregory Tai-Apin, IT manager for Banking Network Suriname (BNETS), about the company’s recent joint certification to ISO 27001 and ISO 22301, the global authoritative standards on information security and business continuity management. He told us that they had received their certificates on the very same day that we had called him. With just over 550,000 citizens, Suriname is one of the smallest countries in South America. In the late 17th century, England signed Suriname over to the Dutch in exchange for the Dutch colony of New Amsterdam (modern-day New York). The country was under Dutch rule from then until 1975, when it was granted independence. Dutch is still the official language of Suriname today. BNETS is the central switch provider for the eight major banks in Suriname. BNETS manages the interbank network by using high quality and state-of-the-art equipment to deliver the best possible service to facilitate electronic money transfers. As an integral player in ensuring the banking industry’s ongoing operational efficiency, business continuity management and data security are of paramount importance. Naturally, information security has been at the top of its list of priorities for quite some time. A few years before, recognising the need to apply additional security measures to protect its infrastructure and data, the CEO of BNETS, Mr. Kenneth Hendrison, asked a leading consultancy firm to review its IT maturity levels. 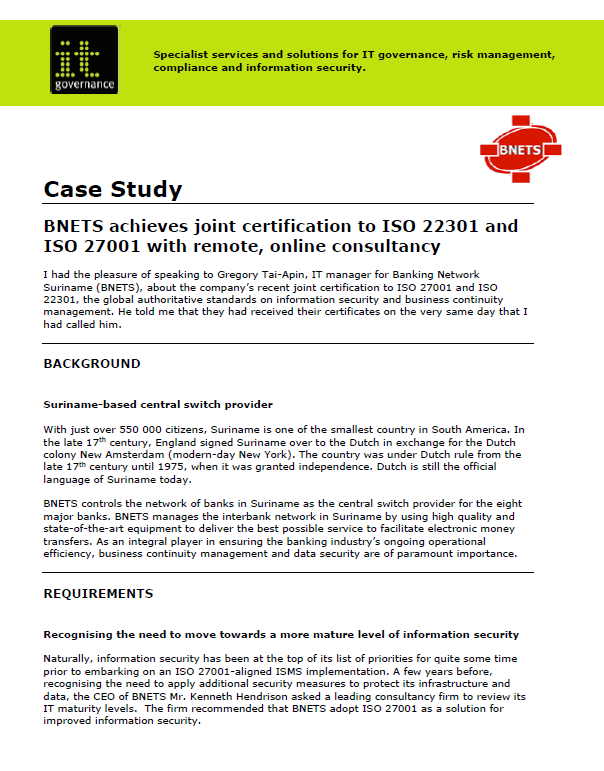 The firm recommended that BNETS adopt ISO 27001 as a solution for improved information security. BNETS was familiar with IT Governance as a provider of management system consultancy solutions, in addition to books, toolkits and training courses.